The Tuesday Morning Briefing at the New York Times tells us that President Donald Trump, at his rally in Melbourne, Florida on Saturday, "claimed that Sweden was experiencing a crisis because of immigration" and had "suggested that a terrorist attack had occurred there the night before." Concerning the latter, Trump said no such thing, nor did he "suggest" it. Concerning the former, if Sweden's not in crisis, it had a funny way of showing it Monday night, as there were riots in Stockholm. You look at what's happening in Germany, you look at what's happening last night in Sweden. Sweden, who would believe this. Sweden. They took in large numbers. They're having problems like they never thought possible. You look at what's happening in Brussels. You look at what's happening all over the world. Note the absence of any form of the words "terror" or "attack." Only someone determined to distort could claim that Trump "suggested that a terrorist attack had occurred there the night before." He didn't. The cadre of determined distorters apparently includes almost everyone in the U.S. establishment press, the ultra-PC Swedish press, and the Swedish government. During his presidency and presidential candidacy, Barack Obama made several unclear and negative statements he would later describe as "inartful" (which still isn't a recognized word). The press shrugged and moved on. With Trump, being a Republican, as Charlie Martin headlined the matter at PJ Media, "Media (Is) Sure It 'Heard' Sweden Comment Trump Never Said." As to the allegedly non-existent crisis, the denials from the Swedish government, the ultra-PC Swedish press (example here) and the U.S. press have been so heated that you would think that the place is heaven on earth. Having so heavily invested in that narrative, they are now clearly reluctant to report Monday night's inconvenient reality. The aforementioned Tuesday morning briefing at the Times doesn't mention Monday's riots, even though, based on the paper's international reach, they should have been and were likely known at the time it was published. It took the Associated Press roughly 16 hours to recognize the riots' existence. As of 8:35 a.m. this morning, the story wasn't in its "10 Things to Know for Today." 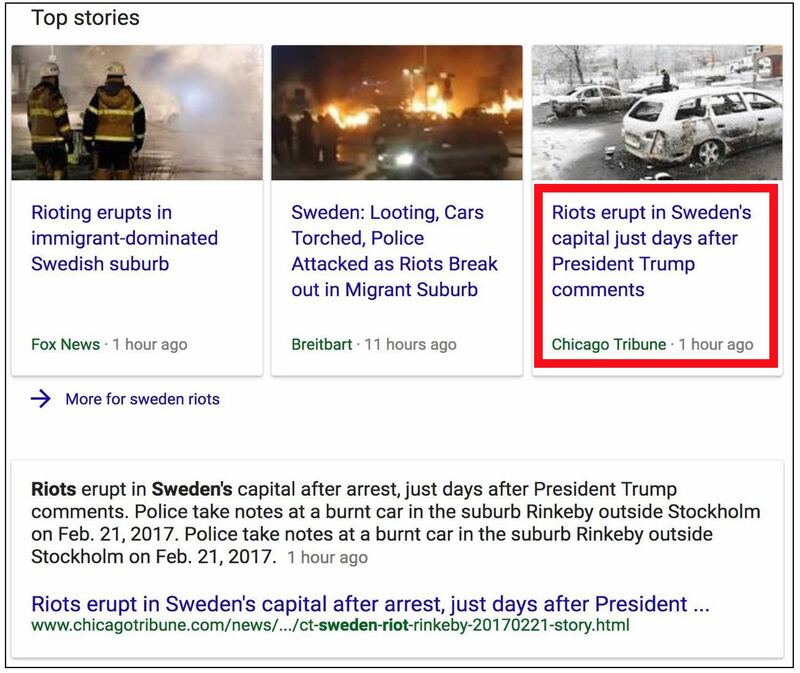 The indefensible reluctance at the AP and the Times to recognize a story which had broken 16 hours earlier, was clearly reportable, based on the six-hour time difference between Sweden and the eastern U.S., and had already been noted at several center-right outlets by mid- to late-evening Monday, likely ensured that they did not get mentioned in any of the Big Three networks' morning news shows. Note that the word "Sweden" doesn't appear, meaning that an attempt to search AP on the country's name doesn't return this clearly related story. Maybe it's an accident, but if so, it's a quite convenient one. The police spokesman's statement above is quite cryptic. THREE Swedish police officers were taken to hospital after being attacked by a violent mob on a routine mission in a ‘no-go zone’ on Friday evening. 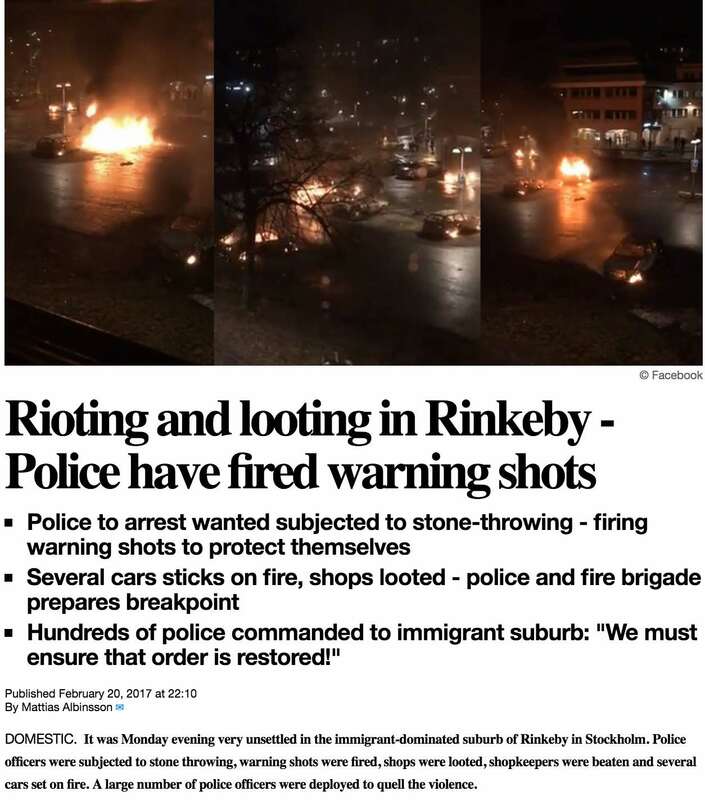 Officers in Sweden’s capital were on patrol in the suburb of Rinkeby when they are set upon by a group of 20-30 thugs. Police spokeswoman Eva Nilsson said the sickening attack on her colleagues happened after they stopped to search an individual at around 11pm. Moments later the mob appeared and started hitting, kicking and throwing bottles and glass at the attending officers. ... The shocking attack on the on-duty officers is just one of many incidents, as officials have placed more than 50 areas on a ‘no-go zone’ list where they admit they do not have control. Gosh, there they are again, those "no-go zones" the press continues to insist don't exist. 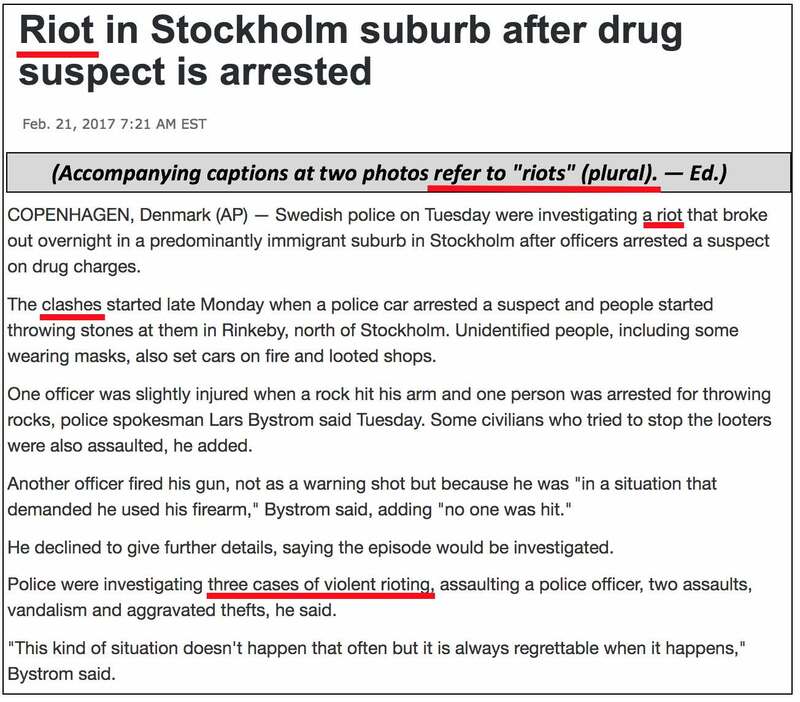 Three and a half years ago, there were five days of riots in Sweden. In September 2016, the political editor-in-chief of Svenska Dagbladet, one of the nation's major daily newspapers, wrote that "it’s only got worse since then," and suggested that "anyone who wants to find out how not to handle a migration crisis is welcome to pay us a visit." Again, that was six and a half years ago. Since then, Sweden, a nation with ten million people, has taken in hundreds of thousands of additional asylum-seekers. Now that events have proven that Donald Trump correct about the existence of a migrant-related crisis in Sweden in virtually real time, the only task remaining for the press is to imply that it's all his fault. As was the case in 2013, the absence of the "M-word," i.e., "Muslim," is quite striking. I suppose the press's willingness to at least acknowledge that "immigrants" have been the rioters constitutes a bit of progress.